As is usually the case with Wyverns, there isn’t much information available for the 303. It was introduced in 1948 along with several other hooded or semi-hooded new models. In truth, the 303 can’t really be regarded as even semi-hooded. It’s a perfectly traditional button-filler. It just doesn’t look it. 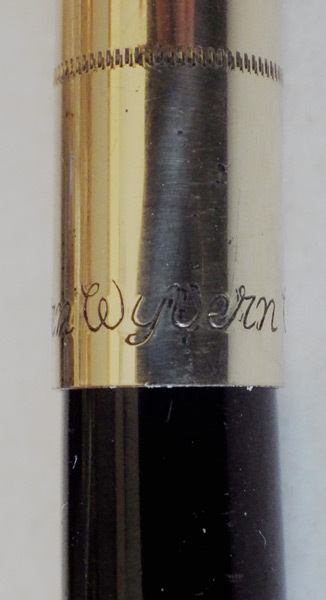 The very small nib is fully visible. Small though it is, there’s still room for the little Wyvern image. The extremely long cap band (if you can even call it that) has no equal anywhere, though perhaps the Waterman Taperite Citation comes close. It is sometimes said that the fountain pen failed in Britain because manufacturers were not innovative enough in the post-war period. I think this pen and several other Wyverns and Mentmores gives this opinion the lie. These pens were very different from what had gone before. In any case, British buyers did not demand innovation in the way that the American buying public did. Besides, the American fountain pen industry suffered almost as much as the British, in the face of the irresistible success of the ballpen. The 303 is a pleasant pen to use. 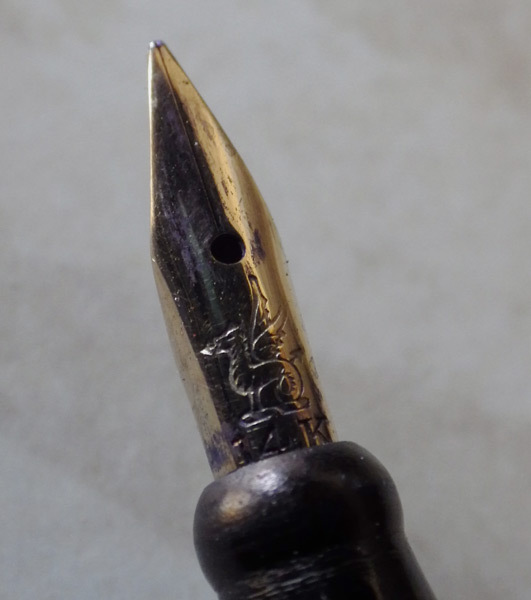 The little nib isn’t flexible but it’s a smooth fine to medium. Grab one if you get the chance but beware – this is one of those Wyverns that have a left-hand thread at the section. There’s a nice example on a Buy It Now here. I expect to be selling this one in due course and I’ll try to undercut that one. By more than a hundred quid. Of course I am a tyro; reading about the numerous curiosities that you find – and know about – is both an education and entertainment.